James Clark born 1782 in and died October 11, 1837 in Madison Co., AR (see below for more details). Ann Clark born about 1802 and died Bet. 1860 - 1870 in Madison Co., AR. She married Joseph W. McMurray, Sr. Bet. 1819 - 1820 in Warren Co., TN. He was born About 1795 and died March 13, 1851 in Near Huntsville, Madison Co., AR and is buried in McMurray Cemetery. Baptise Clark born about 1803. He married Elizabeth (last name unknown) she was born about 1801 and died December 1854 in Madison Co., AR. Hampton James Clark born about 1808 in SC or KY. He married Matilda Drake. She was born about 1808 in TN and died about 1865. They were married about 1835. James Clark born About 1810 in TN and married Elizabeth Jane Martin. She was born About 1828. They were married about 1848. Agnes Clark born between 1812 - 1813 in Warren Co., TN and died in Hill Co., TX. She married Richard Cason Frazie. He was born about 1810 and died 1855 in Hill Co., TX. They were married about 1835. Margaret "Peggy" Clark born about 1815 in TN She married John Melton. He was born 1813 in NC. Virginia Clark born November 1819 in Warren Co., TN and died March 1903 in Madison Co., AR and is buried in Old Vaughan Cemetery. She married Issac K. Vaughan. He was born about 1818 in MO and died 1897 in Madison Co., AR. They were married May 08, 1836 in MO. What are the details surrounding the death of William Henderson Clark? He died in Gen. Hospital, Little Rock, Pulaski Co., AR of pneumonia during the Civil War. He served in the Union Army with Company B, 1st Regiment of Ark. Volunteers. William Henderson Clark born 1823 in Warren Co., TN and died January 27, 1865 in Gen. Hospital, Little Rock, Pulaski Co., AR and is buried in Nat. Cemetery in Little Rock, AR Sec. 1 Grave 345. He died of pneumonia during the Civil War. He served in the Union Army with Company B, 1st Regiment of Ark. Volunteers. Sarah E.Hester born about 1828 in TN. They were married about 1841. Abraham Clark - born about 1842. Hetha Whorton born about 1832 in GA or AL. She died 1923 in Yale Cemetery, Johnson Co., AR. Her parents were Jepthah Whorton and Dollie (Malone?). 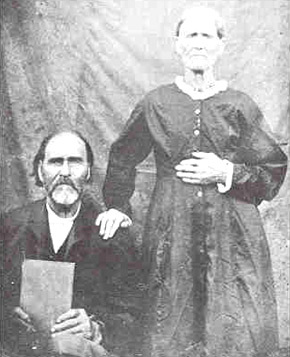 They were married July 25, 1852 in Madison Co., AR. Eliza Clark born about 1877 and married Elsworth Carpenter. Davis Henderson "Hent" Clark born January 1880 and married Minerva Pace. Rufus E. Clark was born March 1883 and married Nancy M. "Peggy" Bowling born about About 1889. Children: Marie Clark born about 1909. Cora Ida Clark born May 1885 and married William Josephus Karr. Bert Clark born April 1891 and married Maggie White. Rebecca Clark born November 1893 and married Rufus Reed. Tennessee Clark born July 1895 and married Vernie B. Osgood. Redmon Clark born March 1899 and married Allie Harkness. Syotha Tennessee Clark b. September 01, 1856 or 58 (see below for more information). Fanny Clark born January 1887 and married Floyd Burk. Florence Clark born January 1889 and married Luther Eaton. George Washington Clark born December 30, 1861 and died August 29, 1937 and is buried in Box cemetery near Vian, OK.
Cora Ellen Clark born August 16, 1885 and married Charles Claud Karr. Kellar Chloe Clark Born October 17, 1887 and married Minnie Hardin. Ora Clark Born June 17 1890. Sidney Clark born June 20, 1892 and married Lola Pace. Minerva Clark born July 8 1894 and married Charles Day. Mattie Pauline Clark born February 25, 1899 and married Charles Frank Karr. Earnest Clark born June 17, 1904 and died March 07, 1906. Lou Clark born August 25, 1907 and married Floyd Lewis.